The week’s Friday Fibers Roundup features a mix of exhibitions, books, and reviews all center around the concepts of craft in a contemporary and historical setting. 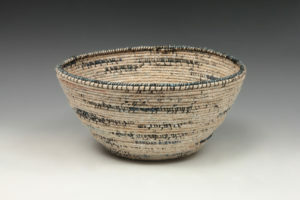 Barbara Shapiro Kami Vessel 2016, Japanese printed and calligraphy papers, indigo dyed paper, cloth, stiff silk thread, wired paper rush, 4.25” x 9” in diameter. 1) Sheila Hicks’ new exhibition: Free threads. Textile and its Pre-Columbian Roots, 1954-2017 has been up since last November, but there’s still time to see it. On display at Museo Amparo in Mexico City, the show is up until April 2, 2018. 2) “Get To Know: Karen Hampton” from The Tung features her exhibition Shape Shifter. The show spotlight’s Hampton’s craftsmanship and mastery of thread, with such precision which she combines and contrasts colour, symmetry, shape and character. 3) “Textiles–The Sleeping Giant of Contemporary Art” by Gina Fairley examines new work by Turner Prize recipient, Keith Tyson as the dialogue around contemporary textile art expands (via Visual Arts Hub). 4) The exhibition Vegetable Lamb of America: The Art of Sarah Wagner features work in wood and fabric, creating animals and environments that address the fragility and resilience of Nature and humanity’s impact on its surroundings. On display at The Muskegon Museum of Art through March 18, 2018. 5) “Nick Cave sees Frist Exhibition as Platform to Inspire Empathy, Optimism” by Melinda Baker looks at Cave’s new show at Frist Center (Nashville, TN) whose practice revolves around transforming materials and discarded objects into extravagant, immaculately constructed mixed media assemblages that span a range of mediums, including sculpture, installation, sound, video, dance, and fashion (via Tennessean). 6) “The Seamless Weaving of Fine Arts with Crafts” by Glenn Adamson spotlights how Anissa Mack used the 1996 county craft fair as inspiration, context, and content, making curating her art form (via Hyperallergic). 7) Colossal spotlighted the MFA in Textiles program at Parson’s The New School in NYC. Launching in 2018, the program is designed to prepare creative leaders for the broadening range of textile applications, including fashion and wearable tech, auto and aerospace industries, heath care, and interiors and architecture. 8) An online trove of historic sewing patterns and costumes have been posted online. Artemisia Moltabocca, creator of the historical and cosplay costuming blog Costuming Diary, has provided a list of free historical medieval, Elizabethan and Victorian patterns (via Open Culture). 9) “Fewer Better Things: The Hidden Wisdom of Objects” is a new book by Glenn Adamson to be published in August 2018. If you can’t wait until then, here’s the full introduction. 10) The article “Renuka Reddy on her Mission to Restore Handmade Chintz it its Past Glory” looks at how the traditionally laborious technique has given way to digital prints and synthetic methods (via Verve).